Learn Dutch 6,000 Words is an interactive Dutch language learning app that comes with a rich vocabulary. The latest version of the self-learning app was recently launched through Android app marketplace. Learn Dutch 6,000 Words, a popular self-learning app designed and developed by Fun Easy Learn, recently underwent major design modifications. The developers at Fun Easy Learn expressed hope that the app has all the features that their existing users were desperately looking for all these days. They said that they took user feedback very seriously and after careful consideration, the design and UI was revamped. According to the developers, the end product or the Learn Dutch 6,000 Words Version 4.52 is compatible with Android 5, with full support for Android 3.2.2 and later versions of Android. Fun Easy Learn owners claimed that the interactive language learning app is a gift to their existing users before Christmas. They said that the material design is completely new now and the database images have also been replaced or modified to give the app a new look. 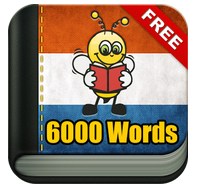 They expressed great hope that the latest version of Learn Dutch 6,000 Words will do well in the android marketplace like its immediate predecessors. According to them, the app has been downloaded by more than 500,000 times by users across the world. “Dutch learning should be a fun and interactive experience for self-learners. We tried our best to improve the usability aspects apart from the aesthetics. The initial response has been very good. This is probably because the app has changed on both inside and outside. On one hand, the users will be pleasantly surprised to see the new design. On the other hand, the added usability aspects have also been widely acclaimed. We are quite sure that the newly designed app will break all previous records of number of download”, said the CEO of the firm during a recently held press conference. “To learn Dutch, all one needs is a clean interface and an interactive learning environment. We believe we have successfully brought those features in our newly designed app”, added the CEO of the firm during the press event. He also hinted that the other apps from the same franchise may be redesigned in the coming days.